The National Society Daughters of the American Revolution (NSDAR or DAR) was founded in Washington, D.C., on October 11, 1890. The organization was a natural outgrowth of two men's patriotic societies...The Sons of the Revolution and the Sons of the American Revolution...both of which voted to exclude women from membership. Credit for the actual founding of the national society is given to Miss Eugenia Washington, Mrs. Ellen Harder and Miss Mary Desha. Denver founded its own chapter on May 26, 1898. Mrs. Mary Greene Montgomery Slocum, wife of Colorado College President William Slocum and president of the Colorado State Society, helped with the chartering of Denver's chapter. The 1900-1901 yearbook lists 66 members; by 1901-1903, there were 90. One of those early members was Elizabeth Fletcher Brown Lennon, a Real Daughter. As the name suggests, a Real Daughter is an actual offspring of a Revolutionary War patriot. Her father was Samuel Brown, a second lieutenant in the War. Henry C. Brown, builder of the Brown Palace Hotel and donor of the land on which the state capitol stands, was Mrs. Lennon's brother. We have many women from all walks of life whose ancestors participated in some way, in the Revolutionary War. The DAR has chapters all over the world and our Denver Chapter NSDAR is growing. 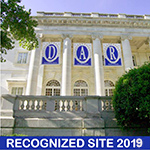 For detailed information on membership in the DAR, go to the National DAR website. Through the generosity of the Edith Kennedy Wilson estate, a scholarship is awarded annually by the Denver Chapter of the DAR. Our winner will be asked to be present at our May meeting & luncheon.